No matter what you call it – pan fried steak, country fried steak, chicken fried steak or CFS – the fact is Texans love it! So much so, that restaurants in that great state serve more than 800,000 chicken fried steaks each and every day, according to the Texas Restaurant Association. And while many “outsiders” think barbecued brisket and beanless chili characterize the state’s cuisine, any real Texan will tell you it’s chicken fried steak that’s the real king. Over the years, the exact origin of chicken fried steak has been distorted by any number of myths, legends, and conjectures. For example, the Lone Star Book of Records states that chicken fried steak was invented in 1911 by Jimmy Don Perkins in a small Lamesa, Texas cafe. The truth is, Jimmy Don did not invent chicken fried steak, and the entire story is a total and complete fable. Adding even further confusion to its history are reports that chicken fried steak first appeared in 1949, 1950, and 1952; in the South, the Midwest, the West, and Southwest. What most food historians do agree on is chicken fried steak can be traced to German-Austrian immigrants who settled in Texas between 1844 to 1850. With these transplanted Europeans came a popular breaded and fried cutlet dish known as weiner schnitzel that was quickly adapted by ranch cooks and farm wives throughout the state as a way of enhancing the flavor and texture of tough cuts of beef. Contrary to what the name may imply, chicken fried steak is not chicken, but rather beef. Traditionally, it is a half-inch thick slice of round steak that has been pounded into submission with a wooden or metal mallet so as to become palatable. This tenderized steak, in the same manner as fried chicken, is dusted with seasoned flour, dredged through a milk and egg mixture, and then placed back into the flour to be well coated. Finally, it is fried in hot lard or shortening until the coating is crisp and golden brown. Thus, the name chicken fried steak. It is normally served next to a heaping helping of smashed potatoes, both of which have been smothered in a thick, peppery cream gravy. Ooooah! 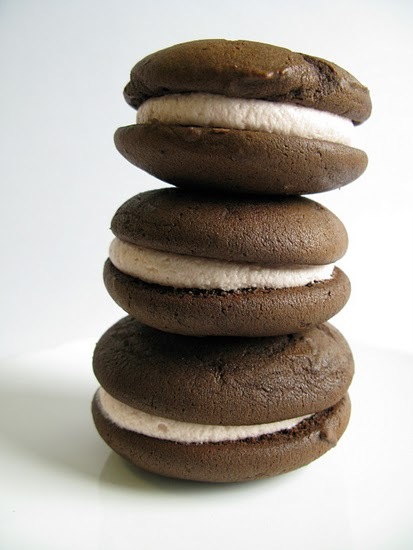 Just the thought of this culinary delight makes any true Texan’s mouth water with anticipation. Variations of this traditional dish are as many as the cafés, restaurants, and diners that serve them. And while those with less discerning palates may be content with frozen patties, soggy factory breading, and tasteless gravy as doled out by many national chains, true chicken fried aficionados seek out establishments that have built their reputations on serving this classic Texas fare. Joints that strive to keep chicken fried steak in the high position of honor deserving of any culinary masterpiece. 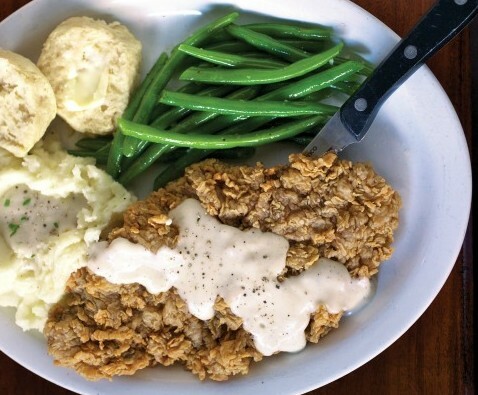 So if you’re ever down that way and want a real Texas food experience, just stop in almost any mom and pop café and enjoy chicken fried steak for yourself. Find Em: Threadgill’s in Austin, Massey’s in Fort Worth, Ranchman’s in Ponder, Cafe 290 in Manor, and Goodson’s in Houston.